Has anyone had success with a coping/tenoning sled for a shaper capable of supporting large long and wide workpieces? Or can you recommend a factory made unit? Details please and photos are appreciated. Thanks. Long parts on a sled that sits on a table have some danger built into them since the weight of the far end can lift the sled and part up and into the cutters in some unplanned way. Aigner or Euro type table extensions can help with this, but only if they are robust and dead level with the table. Martin USA carries this one. It's suitable for typical door and window work. It bolts to the shaper table so it is very solid and stable. Not sure what you mean by large and long. You want to get a sliding table shaper. They have an integrated ball bearing cast iron table. It has mass and is firmly affixed to the shaper with large 2" plus bearings. You can bolt a fancy or simple stick to the table with a decent but likewise not anything special and you can easily achieve 2 thousands accuracy. If you have a basic shaper and want to accomplish the above, then you may want to reconsider all the time it will take to duplicate it on a regular shaper. It may be better to sell one and buy a slider. But 2 shapers are always better than one. Have one do the cope and the other do the pattern. What size cutter heads are you planning to use? How much material will be removed? Our window tooling is 320mm in diameter and the idea of running this on a shaper with shop-built contraption scares the pants off me. 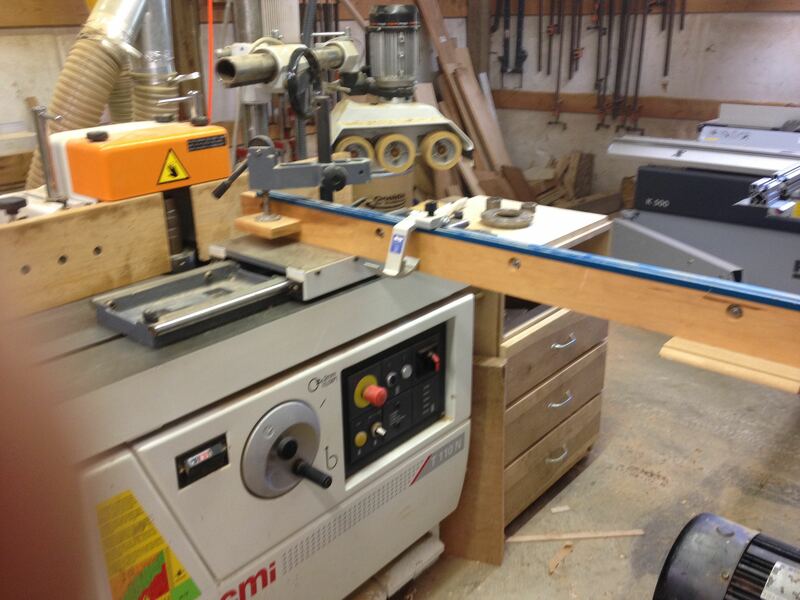 I have run similar tools on a Martin T12 with tenoning table and it was pretty scary. The tool wants to draw the workpiece in so hold down is critical. An eccentric clamp is not usually sufficient. Presently, we do this on a SAC Tenoner, where it's all nice and safe. My biggest sets are the 7-1/2" window tooling sets from Schmitd. I'm interested in the unit Martin sells. Can someone post a link to it? By large long and wide I mean 16" x21/2" x 48" door rails. I know this is more than just a sled but we use a Felder sliding table shaper with the optional outrigger and it works great for long, wide items.